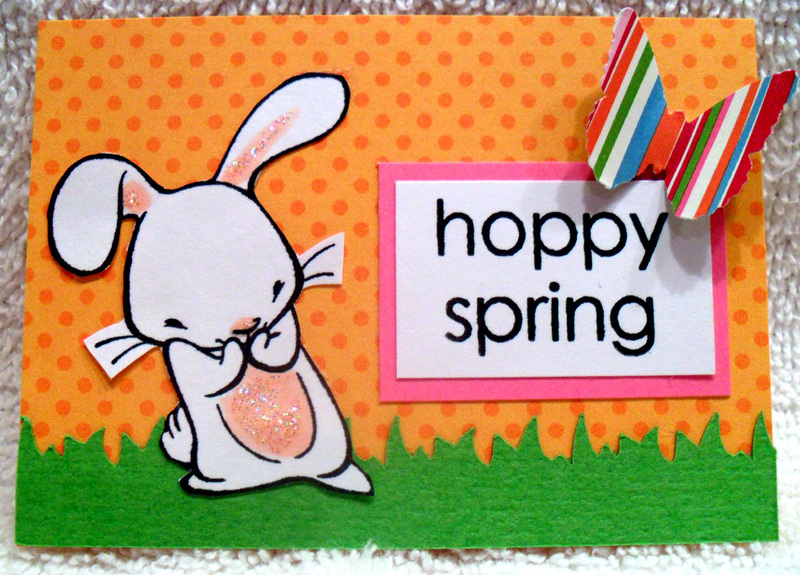 The Unknown, Entertaining Mind of Miss Dena Jones: Lollipop Crafts Challenge: Anything Easter Goes! Hi, everyone! 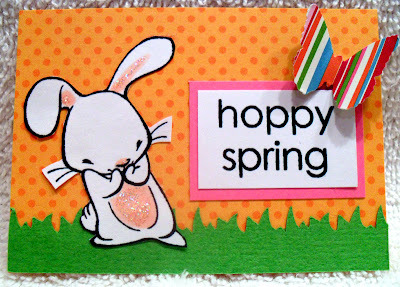 This week's challenge over at Lollipop Crafts is: Anything Easter Goes! I created an Artist Trading Card. If you're not familiar with ATC's, they are cards that measure 2 1/2 by 3 1/2 inches. They are traded with others. I've done a bunch of these for various swaps in the past. At one point, I got tired of doing them, but I actually find that I now enjoy doing them from time to time. This ATC features Daba from Sister Stamps. I think Daba is such an adorable bunny that anyone would want to cuddle! I added a little bit of color to Daba with a Copic pen (blush) and then added a little bit of sparkle by way of Star Dust Stickles (my fave!). The sentiment is from an Inky Antics set. The grass border is a cut file from svgattic.com. The butterfly was punched out of some rainbow striped pp. Awww, this is super cute Dena! Daba is adorable and so cute with his sparkly belly. Gr8 use of the ATC format. This is adorable! Wonderful creation this week! Thanks for using Daba in your Anything Goes project! Very pretty creation!... adorable! GREAT JOB!